Motor blowers and exhausters arrive at Bowers Two of our traction motor blowers and two exhausters were forwarded to Bowers for overhaul from our 2009 spares acquisition spree. 19th June 2009. Two of our traction motor blowers and two exhausters were forwarded to Bowers for overhaul from our 2009 spares acquisition spree. 19th June 2009. Unloading the exhauster at Bowers The machines were then offloaded directly into Bowers workshop ready for assessment and overhaul. Here one of the exhausters is seen being unloaded by Bowers gantry crane. 19th June 2009. 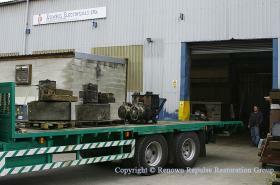 The machines were then offloaded directly into Bowers workshop ready for assessment and overhaul. 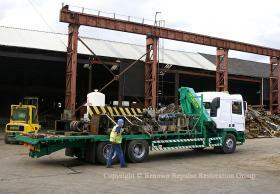 Here one of the exhausters is seen being unloaded by Bowers gantry crane. 19th June 2009. Unloading motor blower bowers rem copy One of the traction motor blowers is unloaded at Bowers. 19th June 2009. One of the traction motor blowers is unloaded at Bowers. 19th June 2009. About to offload motors at Peak Rail June the 17th, 18th and 19th 2009 were a very hectic few days for RRRG, as we had a massive shuffle round of equipment. Activities started on the 17th June with Scotts Heavy Haulage collecting an ETH/Auxiliary Generator set and two traction motors from Bowers Electrical of Heanor. These machines had been moved to Bowers along with the ETH/Auxiliary generator set that has been overhauled by Bowers for use in 50030. As we had no plans to have any work undertaken on these machines in the near future the decision was taken to move the machines up to Rowsley and free up some space in Bowers workshop. 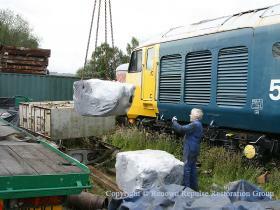 The machines are seen here arriving at Rowsley on the 18th June as preparations are made to unload them. Also seen in the picture are a significant number of old cylinder liners, a roof panel, roof section, and old electrical cubicle, all of which were to be loaded later in the day and sent to C.F Booths for scrapping. 18th June 2009. June the 17th, 18th and 19th 2009 were a very hectic few days for RRRG, as we had a massive shuffle round of equipment. 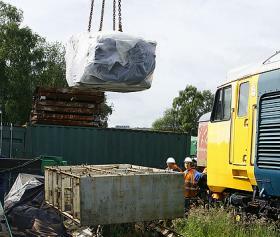 Activities started on the 17th June with Scotts Heavy Haulage collecting an ETH/Auxiliary Generator set and two traction motors from Bowers Electrical of Heanor. These machines had been moved to Bowers along with the ETH/Auxiliary generator set that has been overhauled by Bowers for use in 50030. As we had no plans to have any work undertaken on these machines in the near future the decision was taken to move the machines up to Rowsley and free up some space in Bowers workshop. 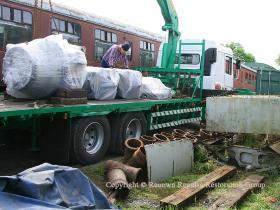 The machines are seen here arriving at Rowsley on the 18th June as preparations are made to unload them. 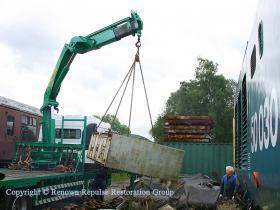 Also seen in the picture are a significant number of old cylinder liners, a roof panel, roof section, and old electrical cubicle, all of which were to be loaded later in the day and sent to C.F Booths for scrapping. 18th June 2009. Offloading a traction motor Here one of the traction motors is offloaded, with two RRRG members looking on. 18th June 2009. 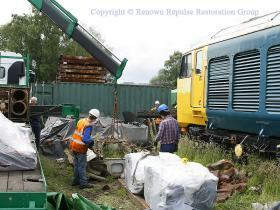 Here one of the traction motors is offloaded, with two RRRG members looking on. 18th June 2009. 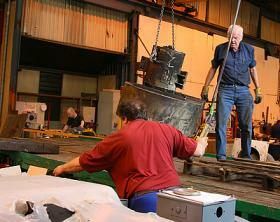 Spare traction motor being unloaded The second of the shrink wrapped traction motors is guided down by Peter Carter. 18th June 2009. 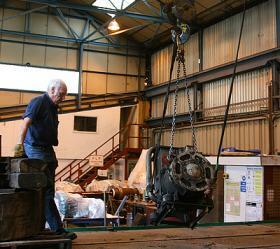 The second of the shrink wrapped traction motors is guided down by Peter Carter. 18th June 2009. Removal of old electrical cubicle A start was then made on loading the various items that were to be taken to C.F. Booths for scrapping, the first of the large items loaded being the old electrical cubicle (which was by this time a completely empty shell). 18th June 2009. A start was then made on loading the various items that were to be taken to C.F. Booths for scrapping, the first of the large items loaded being the old electrical cubicle (which was by this time a completely empty shell). 18th June 2009. Loading rad fan housing Here Dave Rolfe and Chris Bodell are seen putting the chains on the old radiator roof panel ready for loading. 18th June 2009. 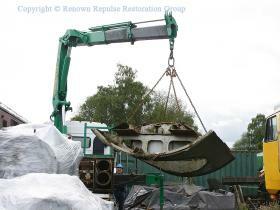 Here Dave Rolfe and Chris Bodell are seen putting the chains on the old radiator roof panel ready for loading. 18th June 2009. Loading fan section Here the roof panel is loaded, to the left is seen an ETH/Auxiliary Generator set which was planned to be used in 50029. However in 2010 we acquired a set which was in far better condition, relegating this one to the status of a repairable spare. 18th June 2009. Here the roof panel is loaded, to the left is seen an ETH/Auxiliary Generator set which was planned to be used in 50029. However in 2010 we acquired a set which was in far better condition, relegating this one to the status of a repairable spare. 18th June 2009. Spares lorry loaded at Booths Scotts then took a very well-loaded lorry of scrap to C.F Booths where a complicated weighing exercise took place, ready for the lorry to be reloaded with 17 pallets of spares that we had purchased from C.F. Booths. These included a number of substantial items including an Auxiliary Generator, traction motor blowers, exhausters, etc. Unfortunately the loading process at Rowsley had taken a lot longer than anticipated, resulting in a later than anticipated departure from Rotherham, and we are extremely grateful for the cooperation and assistance of the staff and management at C.F. Booths and Scotts Heavy Haulage. 18th June 2009. Scotts then took a very well-loaded lorry of scrap to C.F Booths where a complicated weighing exercise took place, ready for the lorry to be reloaded with 17 pallets of spares that we had purchased from C.F. Booths. These included a number of substantial items including an Auxiliary Generator, traction motor blowers, exhausters, etc. Unfortunately the loading process at Rowsley had taken a lot longer than anticipated, resulting in a later than anticipated departure from Rotherham, and we are extremely grateful for the cooperation and assistance of the staff and management at C.F. Booths and Scotts Heavy Haulage. 18th June 2009.